More Colorverse inks! I'll be working through a few of them here and there. Colorverse Pale Blue Dot is only available in the limited edition Voyager 1 set, which includes four 15 millimeter bottles. There were 1,977 sets made to commemorate the launch year of Voyager 1, a space probe that is still functioning to this day. Each bottle is named after a key characteristic of the Voyage 1 mission. Pale Blue Dot is the name of a photograph taken just before the probe left our solar system. The Golden Record (though there are actually two) is a record that carries sound files of Earth's life. During Voyager 1's Jupiter Flyby, it recorded much of the information we currently know about Jupiter. Interstellar Space is the region outside of a solar system—Voyager 1 is currently in interstellar space. Pale Blue Dot is a teal color that leans more blue. Pale Blue Dot has a surprising amount of water resistance. Some of the ink lifts off and you can definitely tell that it's been washed onto the page, but it's not too bad and you can still read your writing. It took quite a while for this ink to dry. It was still smearing at the 30 second mark, but it was dry by 60 seconds. There's quite a big difference between the ink in a Japanese medium nib and a 1.1mm stub. It doesn't shade in the finer nib, nor does it get as dark. On Kokuyo MIO paper, I don't see as much sheen. If you hold it up at an angle and squint, you might just be able to catch a slight halo. On Tomoe River paper, there's still a good amount of shading. I like those spots where you can see that it's almost turquoise before settling into that teal color. There's also a little more red sheen, especially outlining letters where plenty of ink was put down. 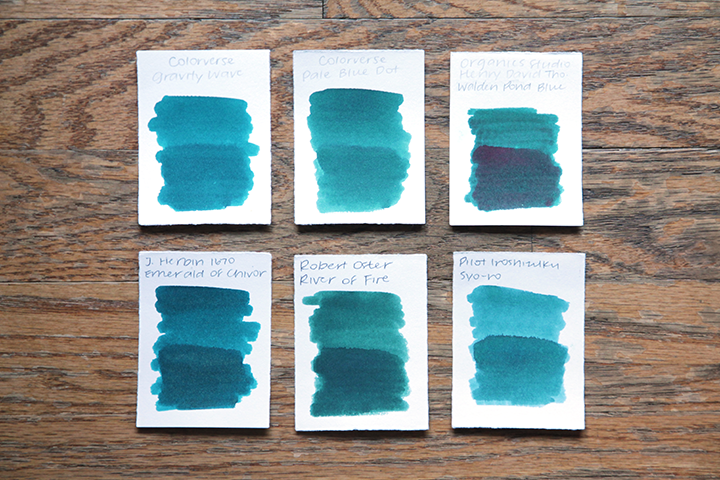 I compare it here to other turquoises and teals that I have. I think it's very close to Organics Studio Henry David Thoreau Walden Pond Blue, though of course this ink is very sheeny. 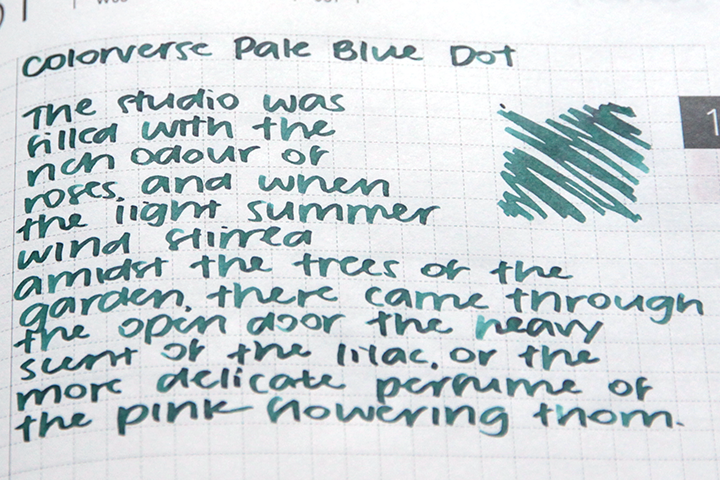 Colorverse Gravity Wave is much bluer, as is J. Herbin Emerald of Chivor (which also has sparkles). Robert Oster Signature River of Fire is too green. 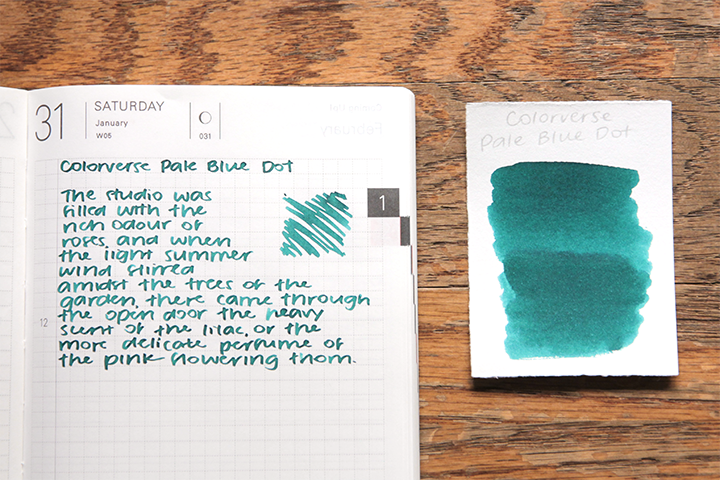 I think Pilot Iroshizuku Syo-ro would be quite close if it wasn't so much lighter. 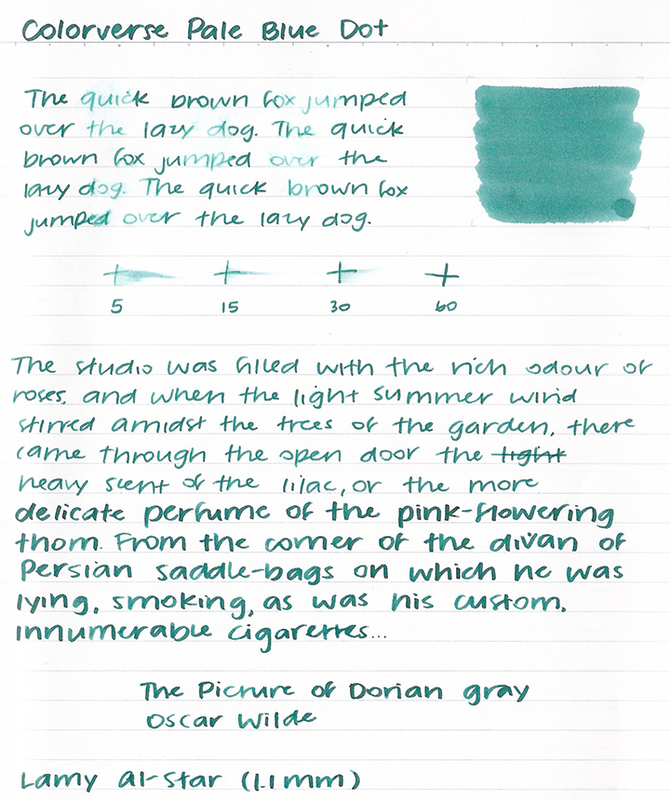 I had this ink in my Lamy Al-Star Bluegreen with a 1.1mm nib. I really enjoyed the two of them together. My Lamy is quite reliable, but Pale Blue Dot also had nice flow. I didn't have an issue with hard starts. This is a beautiful color and I'm glad I got to give it a shot. Despite the fact that only 1,977 sets were made, there are still quite a few in stock at Goulet and JetPens. This is definitely a collector's item and is priced accordingly. 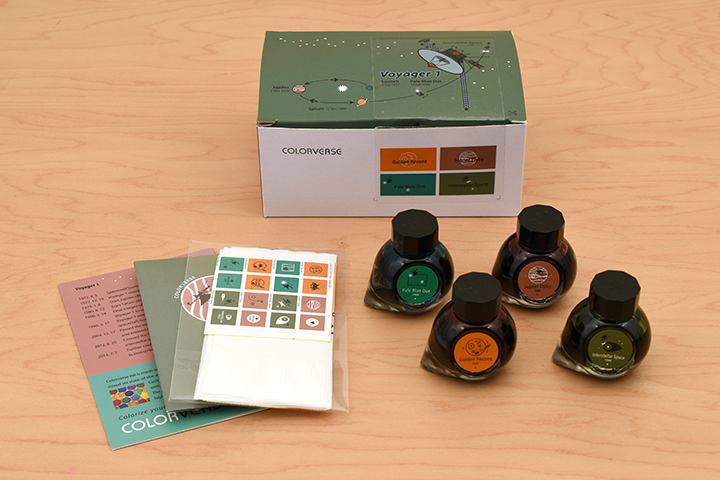 I think it would be a great gift for someone who loves space and fountain pens, but you might be better off getting a less expensive Colorverse set (that will also include more ink for the price!). I got this sample for free, thanks to working at JetPens!